While I was in Osaka, I so happened to look down at random and chanced upon their uniquely designed manhole cover. 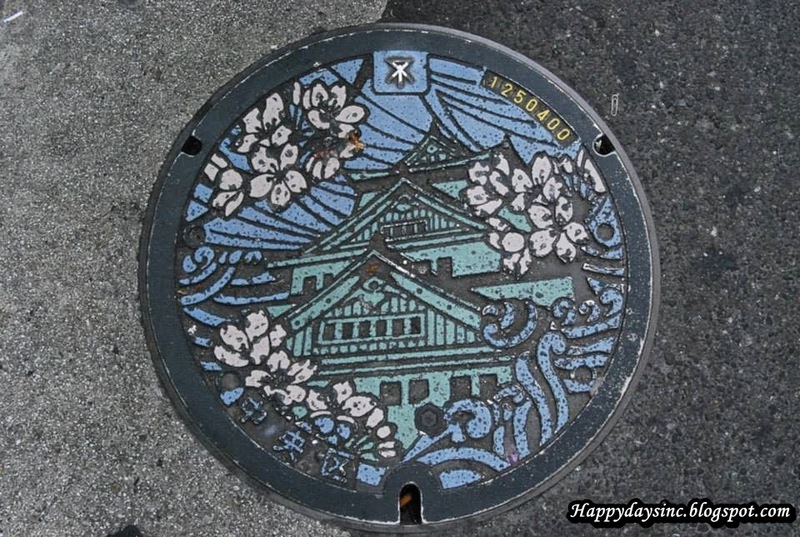 Soon I was noticing this beautiful manholes covers was all over Osaka, Kyoto, Kobe and Nara. Okay la, not a manhole cover but cute nonetheless. Today each municipality in Japan has taken it upon them to come with their own manhole designs which ran range from symbols, surrounding landscapes to famous iconic legends and landmarks. There is even a Japan Society of Manhole Covers that recorded over 6,000 manholes all over Japan. Remo Camerota, a travel blogger even wrote about Japan's manholes in his book, Drainspotting. Here are some of the manhole covers I spotted during my recent visit. I find it amazing that no one has actually stolen them. If this was Malaysia, the grounds and pavement will be riddled with holes because someone would have stolen all the manhole covers overnight. This sadly is no joke which makes Japan and its people all the more amazing, at least, to me. So the next time you travel to Japan, don't just look around, look down as well. I know that Japan is a beautiful country. But i really don't know that they use artistic manhole covers. All the covers of manhole look like so strange that no one can understand that it is manhole covers.